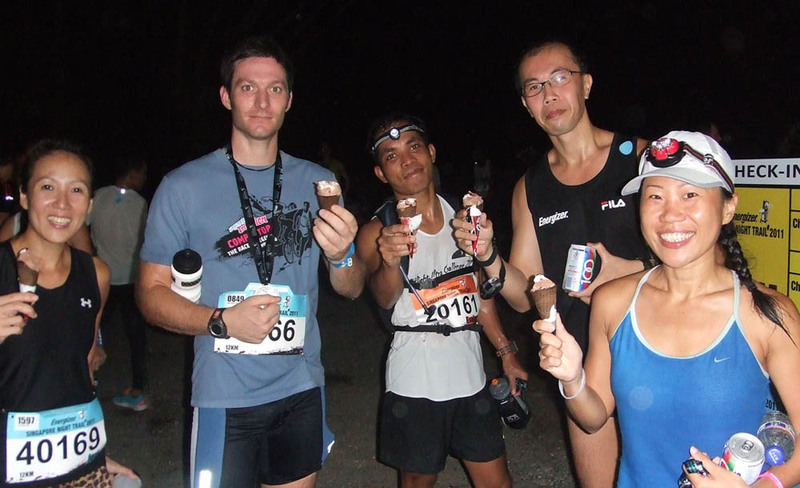 The inaugural Energizer Night Trail Run took place at Lorong Asrama last Saturday night. The organisers had a carnival of sorts going on from about 5pm, with a 1.6km obstacle race for families with children starting in the late afternoon. The 12km race flagged off at 8pm, and the 6km runners started at 8.30pm. The organisers laid on free shuttle buses from Woodlands MRT, and the system seemed to run very efficiently. Upon arrival, some personal trainers from California Fitness were providing a free mosquito repellent spraying service in exchange for a 7-day pass to the gym. It looked like a reasonable turnout, with about a thousand runners doing the 12km, and six hundred or so doing the 6km. The course was well marked and marshalled, with mini reflective cat’s eyes marking the entire course and route marshalls with torches and red backlights showing the way at regular intervals and crucial intersections. I ran the 12km race and we were taken round the army training grounds of Lorong Asrama, inevitably having to climb Hill 256 .. it wouldn’t be right if we didn’t! 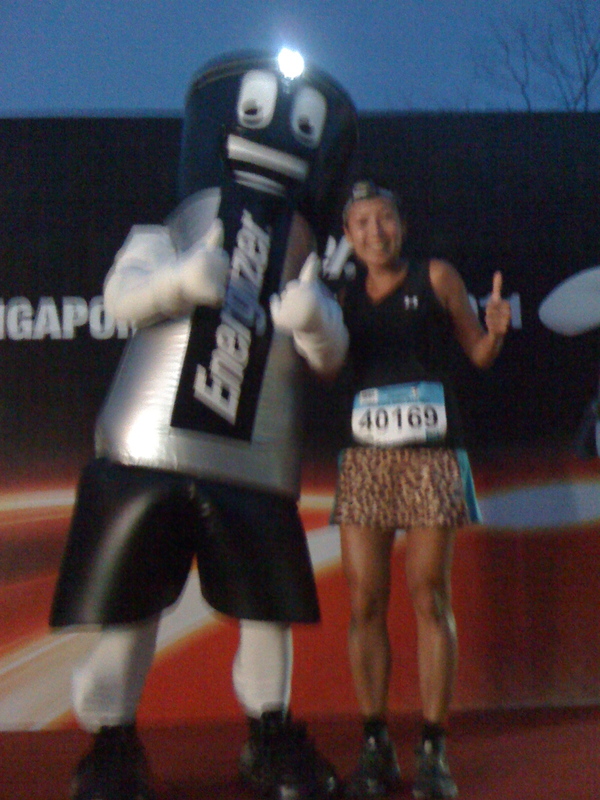 It was definitely more fun in the dark, with most of the runners wearing the mini Energizer headlamps that came in the goody bag. Perfect chance for me to test my new Petzl Tikka Plus .. the old one’s finally given up the ghost! There was absolutely no question of getting lost, everything was well signposted and marshalled. The route marshalls were also careful not to shine their torches and blind the runners, and also lit the way for us with their torches as far as they could. The concern was that some runners would stumble on the steep, gravelled descents or hurt themselves at the many potholes, but that’s all part of the fun, right? te only casualty I heard about was the male runner leading the 12km race. Apparently he’d gotten blinded just before the finish line and fell into a ditch or something along those lines. It was a sufficient detour for the guy in second place to cross the line first .. c’est la vie! It was my second run of the day as part of the 14 miles I had scheduled, but I really enjoyed that run despite dragging my heels to get there earlier that evening. Finished in 4th place, got a picture with the Energizer Battery himself, and caught up with some of the other runners over a free Wall’s ice-cream .. that was a nice treat and I’m sure all the other runners felt the same. All in all, a great night out and I’d definitely do it again .. maybe next year they’ll add a longer course!